Hitting the books hard to study for exams often means many late nights of work. Getting sleepy comes with the territory. Highlighting important text is easy and convenient using highlighter pens. The dye is more see through than ink pens, but are still composed of a product that soaks into fabric. Accidental brushes of highlighter pens against jeans will leave a visible stain. 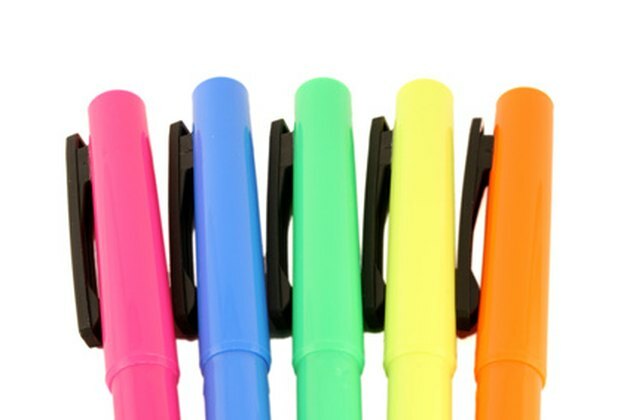 Removal of the highlighter ink as soon as possible will produce more promising results than tossing them in a corner to clean at a later date. Highlighter ink can cause stains. Wipe the highlighter mark with rubbing alcohol. Pour a small amount on a wash cloth and rub lightly. Rinse with warm water. Pour 2 tbsp. of liquid laundry detergent on the stain. Rub it in vigorously. Let it sit for 10 to 15 minutes. Mix 1 cup of color-safe powdered bleach with 2 gallons of warm water. Place the jeans in the solution and let it soak for four or five hours. Wring out the jeans and place them in the washing machine. Add 1 cup of laundry detergent and run them through a normal wash cycle. Check the area to ensure the stain is completely gone. If not, repeat the process of soaking them in fabric safe bleach and laundering. Place the jeans in the dryer and dry them.